Fried Pork Chops are Heavenly! Fried Pork Chops with Creamy Mushroom Gravy are Celestial…they go beyond Heavenly! 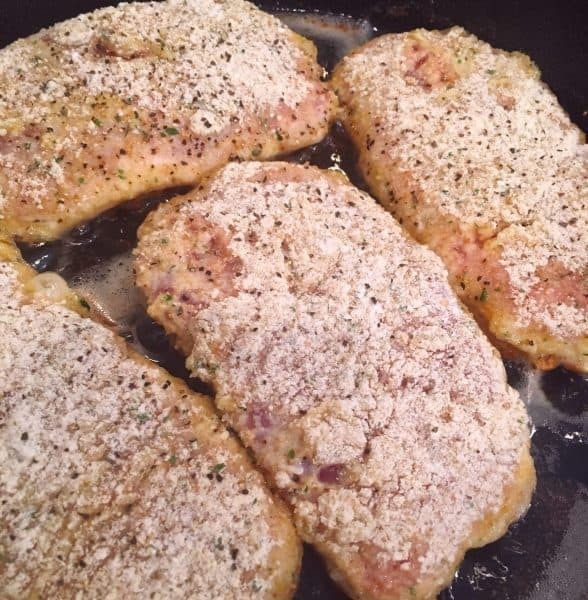 Thick center cut pork chops are dipped in an egg wash then rolled around in seasoned bread crumbs. 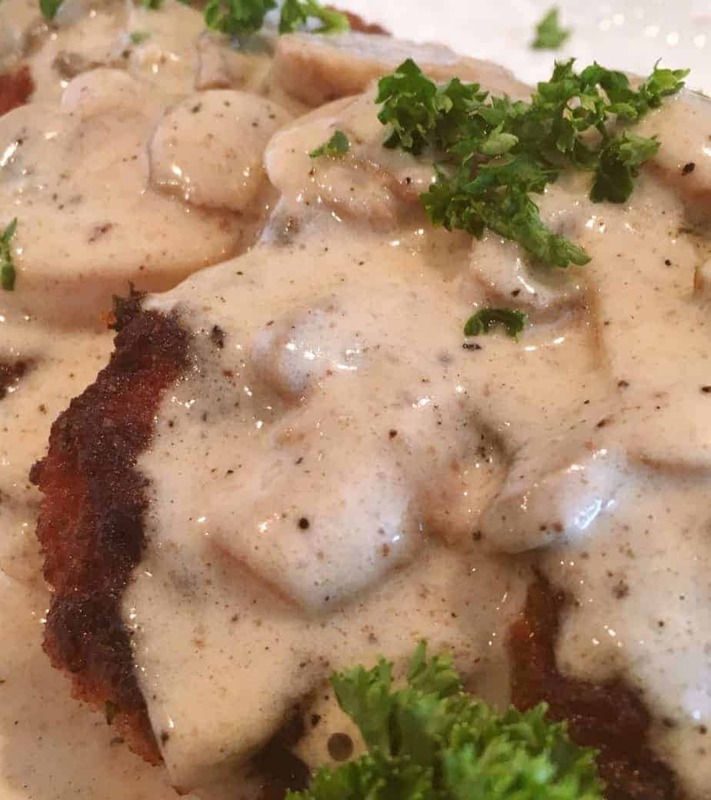 Fried to a crispy golden brown and topped with a decadent, rich, lip-licking creamy mushroom gravy! I’ll be honest I wasn’t sure I was going to even post this recipe. Then Mars ate TWO whole pork chops! 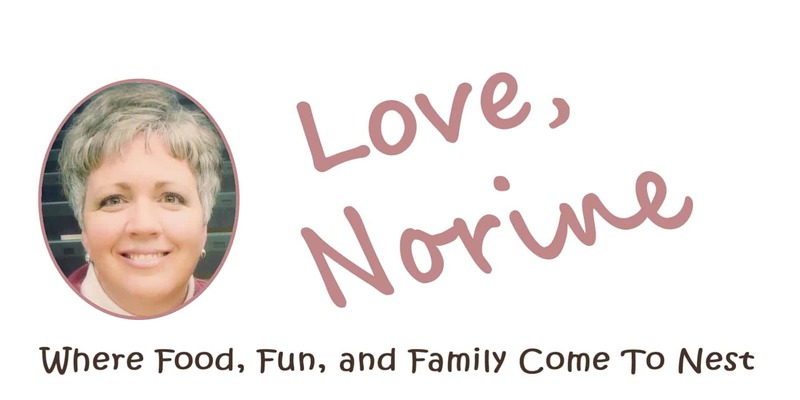 He mumbled through his second, that these were the best pork chops he’d ever eaten… and I quote…”That Gravy”! I love to buy the big package of center cut pork chops from Costco, but any boneless pork chop will do. Mine were about 1/2 inch thick. In another dish mix together 1 1/2 cups of bread crumbs with 1 Tablespoon of Dry Italian Dressing Mix, and 1/2 teaspoon of coarse black pepper. Once both sides are golden brown and thoroughly cooked, place pork chops on a baking sheet and keep warm in the oven. DO NOT WASH THE PAN! 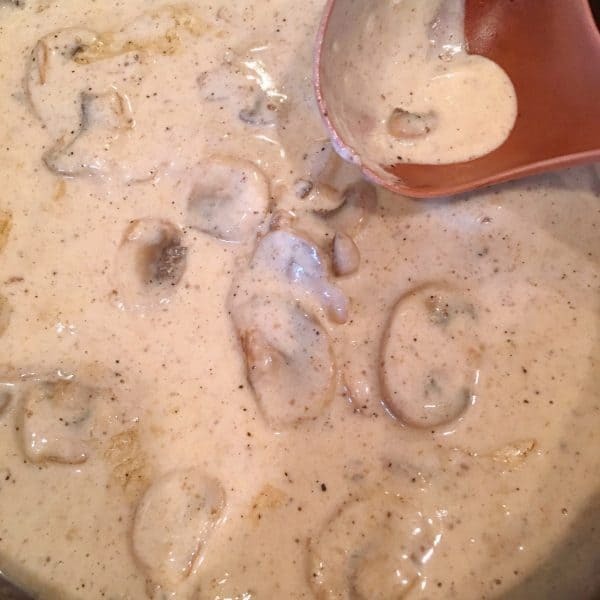 We need all the bits and juices for the scrumptious Mushroom Gravy! This is NOT a cream of mushroom soup gravy. This is the real McCoy! In the same skillet, that you browned the pork chops in, melt 1 Tablespoon of butter. Add 1/4 cup diced onions and 1 cups fresh sliced mushrooms! Don’t ya dare open a can of mushrooms. We need all the wonderful juices from the fresh ‘shrooms! Cook until tender. Here comes my favorite part…Add 1/2 cup of white wine! (It really is like a “spa day”! Lucky piggy’s! Maybe not so lucky! Eh…like Charlotte said “That’s SOME Pig!” lol) Allow to simmer for about 5 minutes over low heat. TIP: You can substitute chicken broth for the white wine! Add 1 cup of Heavy Whipping Cream! Combine and simmer over low heat for 10 minutes until sauce reduces and thickens. Taste the sauce before adding any more seasonings. Remember those Pork Chops were dredged in seasoned breadcrumbs and we used the “left overs” in the pan for this gravy. 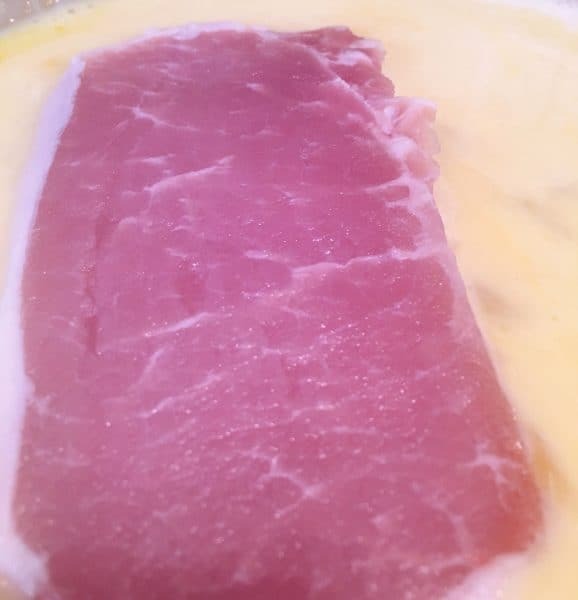 This will make a delicious rich creamy Gravy to pour over your beautiful crispy Fried Pork Chops. Remove Pork Chops from the oven and place on a serving platter. 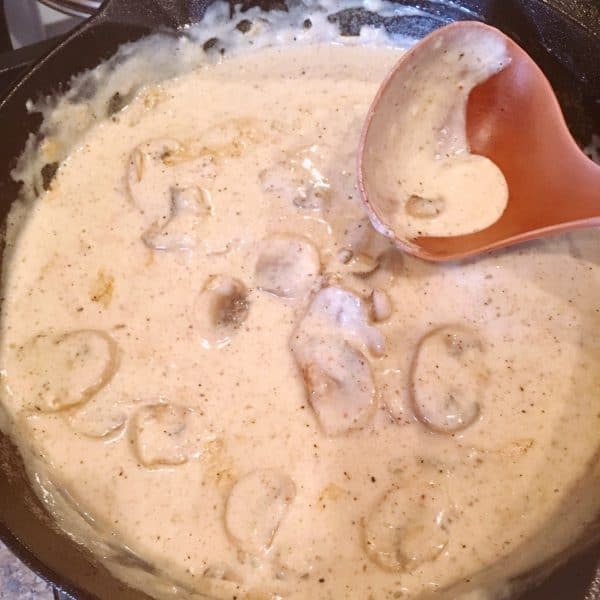 Spoon Mushroom Gravy over the top of the pork chops. I suggest serving these divine Pork Chops with Golden Mashed Potatoes or Egg Noodles. That gravy is just so good you’ll want it on as many side dishes as possible. Bless our Great-Great- Grandma’s who came up with Gravy! Those ladies knew a good thing when the made it! Find yourself a package of great pork chops and have your own “spa” day with those beauties! I know you’ll love the results! 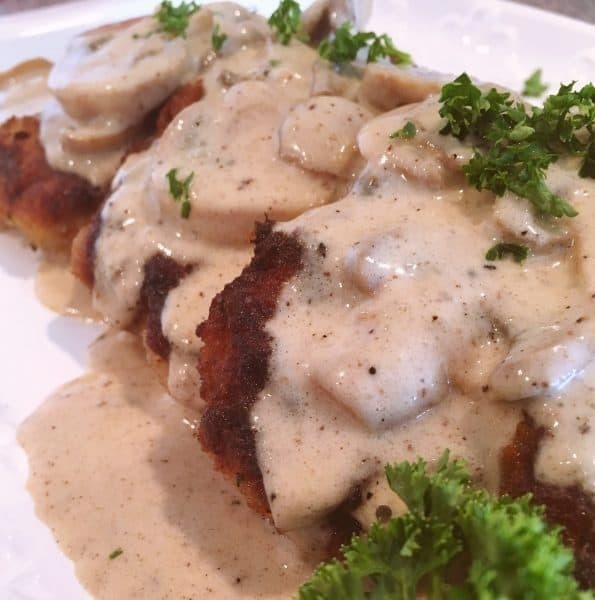 That’s my recipe for perfectly Fried Pork Chops with Creamy Mushroom Gravy! Enjoy! I’m sharing this delicious recipe on The Weekend Potluck and Meal Plan Monday. 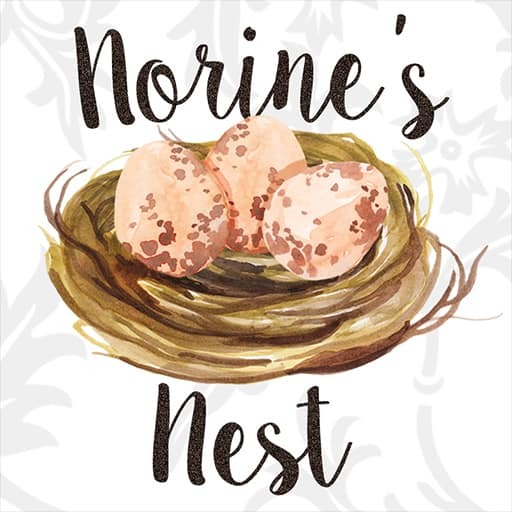 Both wonderful Foodie Parties where you can find all kinds of deliciousness! 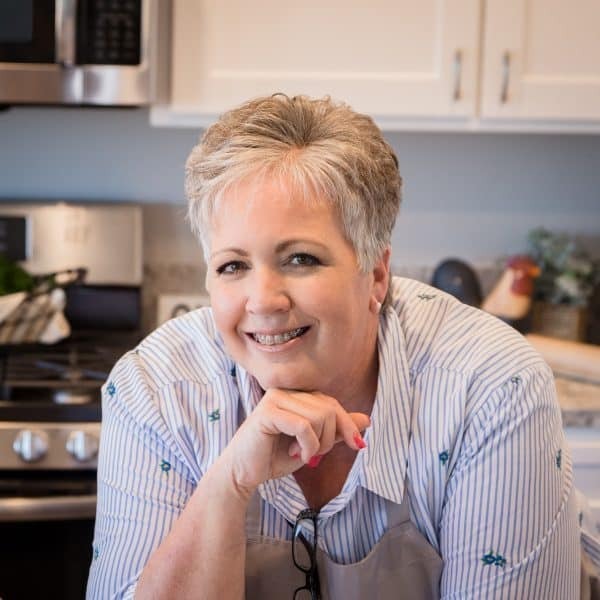 Remember to follow me on Facebook, Twitter, Instagram and Pinterest for all the the latest YUM! Create an "egg bath" In a medium bowl by beating two eggs with 2 Tablespoons water until well blended. In another bowl, or pie plate, mix together 1 1/2 cups fine bread crumbs with 1 Tablespoon Dry Italian Salad Dressing and 1/2 teaspoon coarse black pepper. Mix well. Dredge pork chops through the egg bath then the seasoned bread crumbs. In a large skillet, over medium heat, add 3 Tablespoons of Olive Oil. 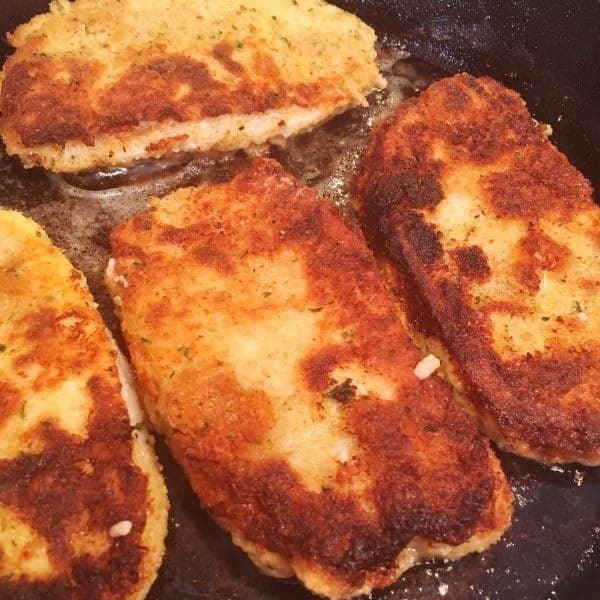 Once oil is hot, carefully add breaded pork chops. Fry until golden brown. Turn over and brown other side. Fry until thoroughly cooked. Place Pork Chops on baking sheet and keep warm in oven. Loosen the bits and pieces in the bottom of the skillet. Add 1 Tablespoon of butter. Melt over medium heat. Add chopped onion and sliced mushrooms. Sautee until tender. Add White wine, turn heat down to low, and simmer for 5 minutes. Add 1 cup of Heavy Whipping Cream. Mix well. Simmer over low heat for 10 minutes or until sauce has reduced and thickened. Remove pork chops from oven. Plate . 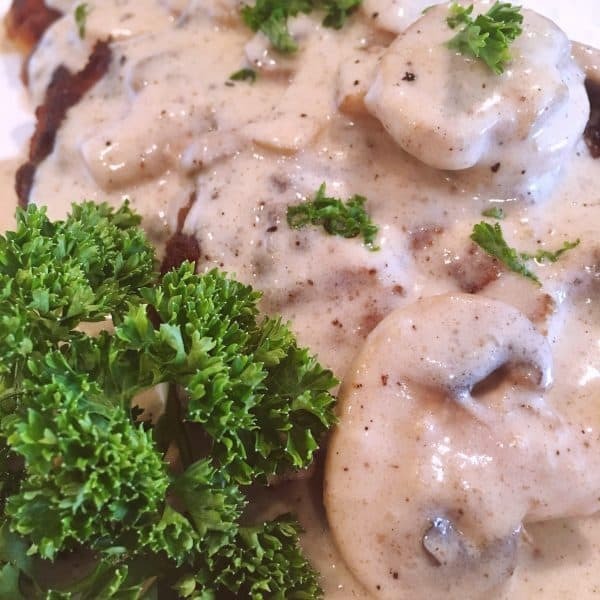 Spoon Creamy Mushroom Gravy over the top of the pork chops. Garnish with Fresh Parsley and serve.